Some of my most read posts to date are those about my love of the NutriBullet and some of the ways I have made use of it. 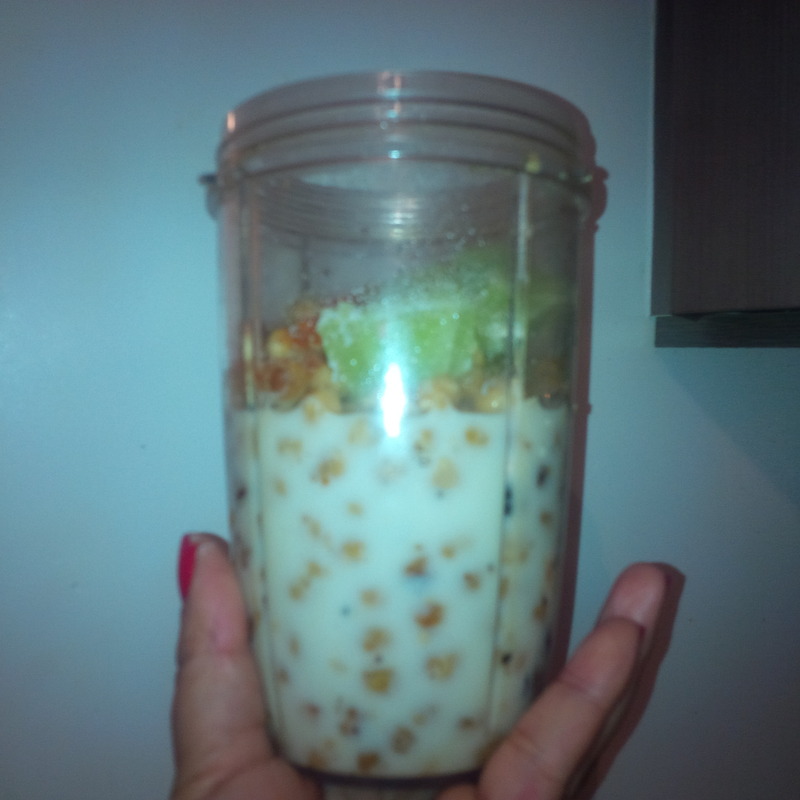 I often get asked if I still use my Nutribullet and love it as much as I initially did. Especially with the introduction of many competing products and newer, more advanced NutriBullets now on the market. The answer is, yes. I use it every day. I have had to replace the blade once ($16), but other than that it is still working wonderfully. My favourite part of past Nutribullet blog posts is the comments that readers leave. Sidebar-Bloggers LOVE comments. If you read a post and take a second to let us know what you thought about it, share a suggestion or offer feedback- it makes our day! I love the opportunity to engage with people who may find themselves on our little part of the interwebs, and we appreciate you taking the time to read and comment more than you know. Nutribullet posts have some fantastic comments with readers sharing their own ideas for using the Nutribullet along with their favourite concoctions. This comment in particular got me thinking. I have admittedly been a little lazier with my NB lately, only using it to blast juices and smoothies. Kelvin’s comment made me wonder why I haven’t been using it for meals. Here at The Neon Leopard we are no strangers to trying to use our NutriBullet for more than just NutriBlasts. We have made ice cream, spice blends, protein powder, flavoured coffees and even hair and skin butter! Now, I am a lazy chef. We have talked about this. So while Kelvin’s curry sounds delightfully delicious. I was looking for a little more simple (no meat to cook) dinner. I still wanted to incorporate Kelvin’s use of the spices and flavours he enjoys in creating a delicious meal. That is the beauty of these creations. Take what you like and mix it together to create something yummy. 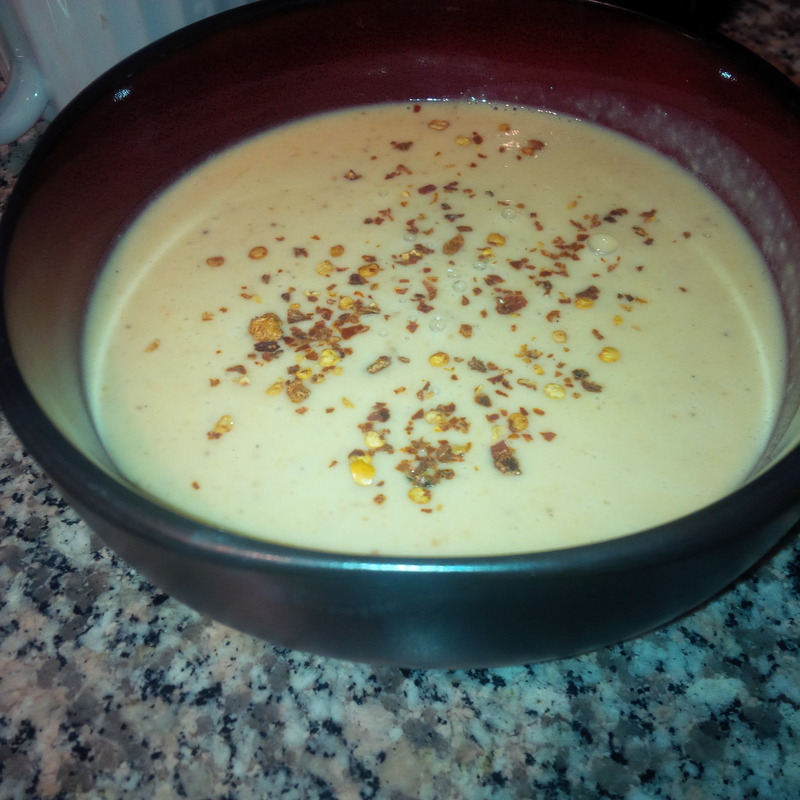 And so I came up with a couple of easy and quick soups that I wanted to share. Now, I know this may be unimpressive to many of you. But this is a feat for the lazy chef. I experimented a bit with making soup when I completed a 10 day juice challenge, but this time I feel I came up with a couple of winners worthy of sharing. Ready for the worlds simplest recipes? I started by cutting about 6 plum tomatoes into three pieces and lining them up in a baking dish. I added minced garlic, dried basil (fresh would have been wonderful but the lazy chef didn’t have any) salt, pepper and drizzled with good quality extra virgin olive oil.I put the whole shebang in the oven at 375 degrees and roasted it for about 30 minutes. After 30 minutes, I removed the tomatoes from the oven and let them cool completely. 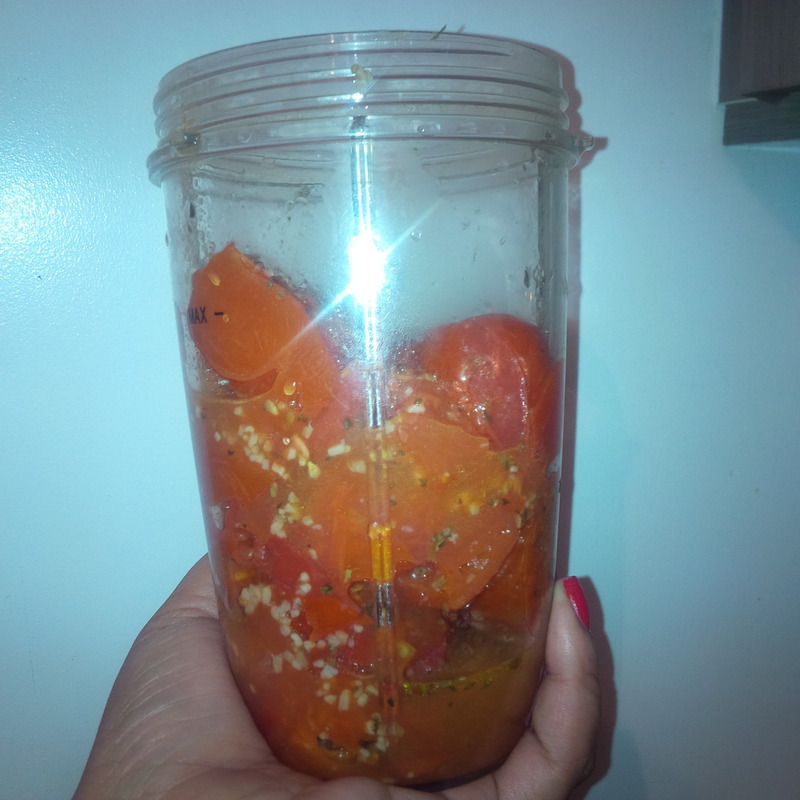 I then loaded it into my NutriBullet and pulsed for a few seconds. I heated my new soup and added more salt and pepper to taste. 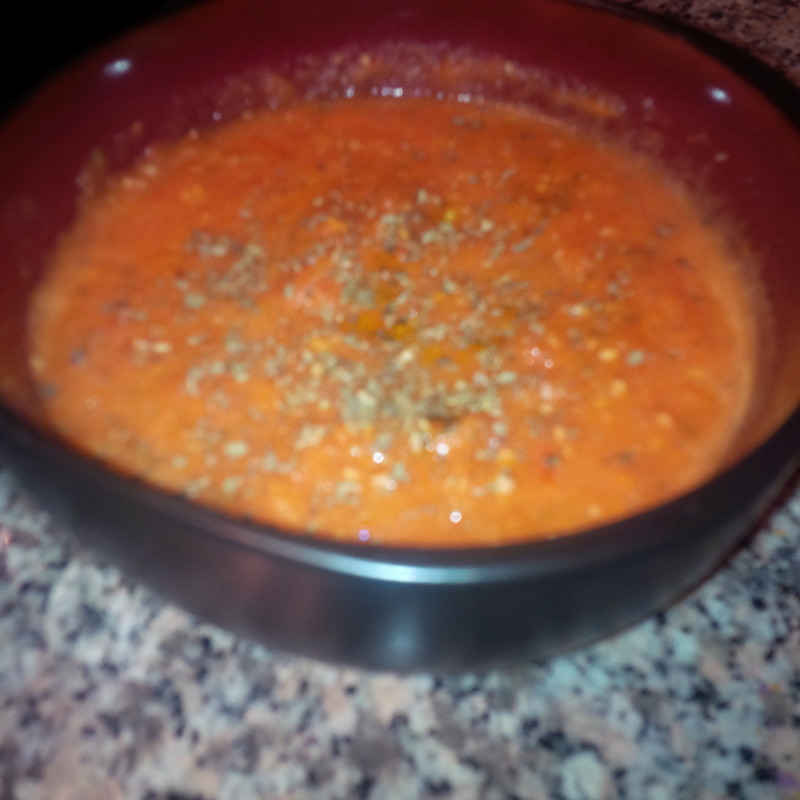 I enjoy a pretty thick tomato soup and I actually like the texture that the skin and seeds of the tomato adds. If this is not for you, you can blast it longer or add water or vegetable stock to thin it out. Like a creamy tomato soup? Try adding cream or milk. You can totally personalize your soup! The end result is so delicious. The simple flavours really come together and it is hearty, rustic and comforting. This soup was actually going to begin with lentils, but I decided to give chick peas a try and was really happy with the result. 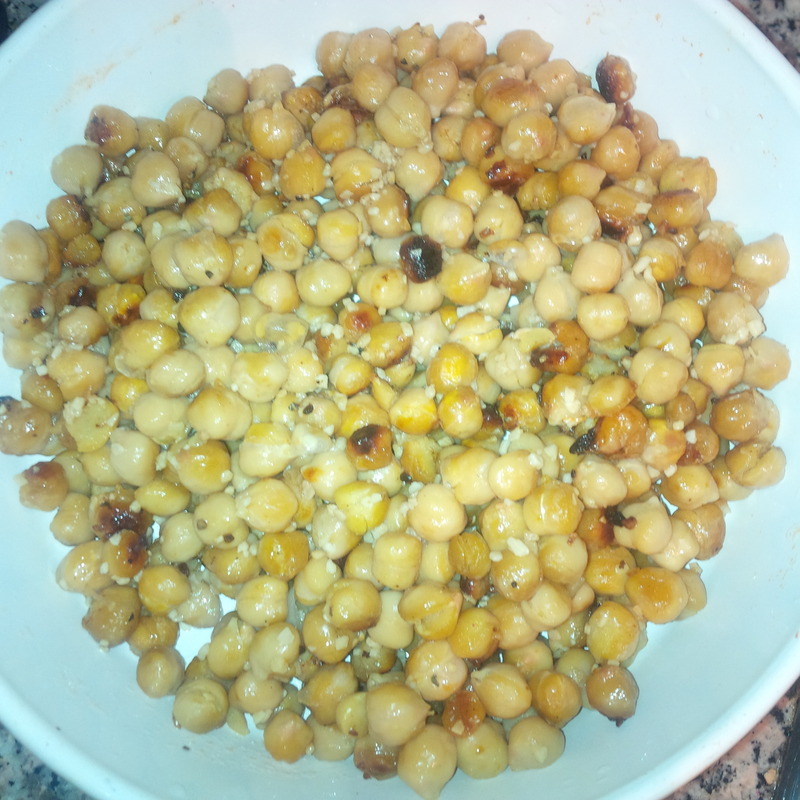 I put a can of drained, rinsed chick peas in a baking dish along with olive oil, cayenne pepper and minced garlic.This went into the oven at 375 degrees for 30 minutes until the chick peas dried out a bit and turned brown. I let the chick pea mixture cool completely, and then put it in to my NutriBullet along with a whole peeled lime, coconut milk, salt and pepper. I love citrus flavour. A whole lime may be a bit much for some palettes, so you may want to add less if trying this for the first time. I blasted this for about a minute until everything was smooth. I had to add a bit more coconut milk at this point as I wanted this soup to be less thick. I heated up my chick pea soup and added some more salt and cayenne pepper to taste. This soup really highlighted the flavours of ingredients that I absolutely love. The end result was flavourful, filling and very delicious. And there you have it , two of the easiest peasiest soup recipes you’ll ever find. I hope this inspires you to grab some of the flavours you love and experiement with quick blender soup as well. If you’ve got some lazy chef recipes of your own, I would absolutely love to hear about them in the comments below. OMG those soups look SO good!!! I too am a lazy chef (not that I really cook or anything!) and I love curling up with a hot bowl of soup on a cold night and these look too delish and easy NOT to try!!!! Wow, if Kelvin cooks like that when his wife isn’t there, what kinds of creations does he pull off when she’s home and he is trying to be impressive? LOL. This post was super-enjoyable and made me very hungry. 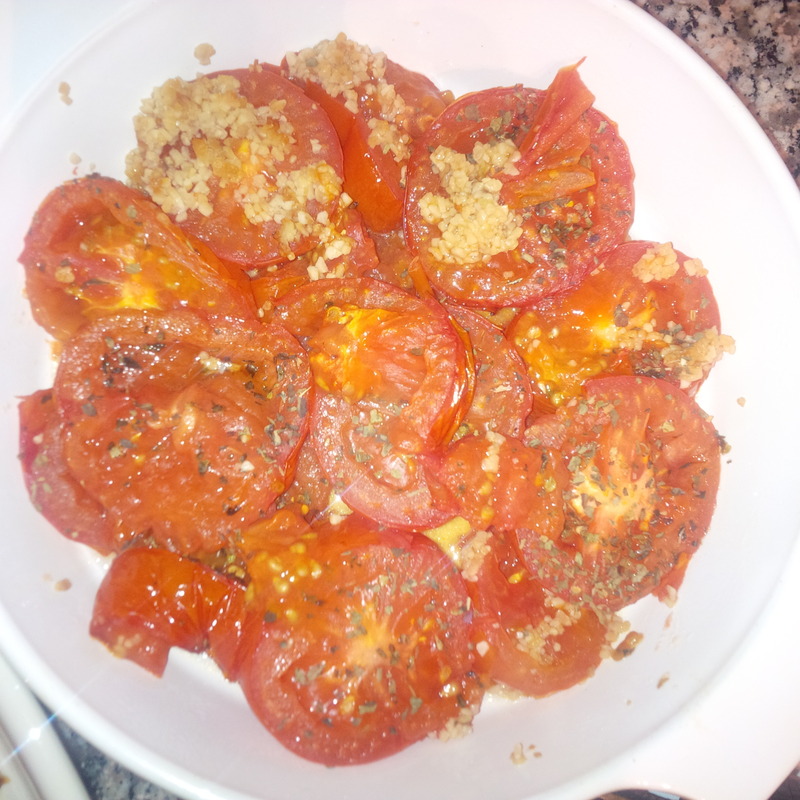 I love that you cut up your tomatos to roast them – why didn’t I think of that? I always roast them whole in a frying pan and them peel of the skin once it goes black. Your way is much nicer. I was reading Chris’ comment that she doesn’t care for chick peas, but likes lime and coconut – you can make a beautiful soup with roasted tomatos, garlic, lime and cilantro, and finish with a drizzle of heavy cream or coconut milk – this uses elements from both recipes, and tastes delicious! Add some toasted tortilla chips or toasted pita strips to the top to make it a little heavier (and it looks kind of pretty). Thank you for sharing! For a “lazy cook” your food looks divine. First of all, both of those soups sound to die for! Secondly, I have a question for you! Is it absolutely necessary to let the soup cool? You may be the lazy chef, but I am the impatient chef! Yesterday I made lentil soup and blasted it in my Bullet (I have a Magic Bullet, not the Nutri Bullet) while it was still hot. It seemed like an okay thing to do — but I wondered if it was bad for the machinery or your health. If so…woops. Hi Suze! I find that if I blast hot liquids it is very difficult to open the lid of the NB afterwards, and then it makes a poping sound like a seal has formed. I just worry about it exploding or something. Hi Shellie thanks for reading and sharing your feedback. I shared the recipe the way I enjoy it. I love it with tons of garlic and find it tasty but as with anything , the fun part is making it your own and tailoring it to your tastebuds. Will do , Ana! Thank you!! Can blend the ingredients first then cook them? Sure as long as you aren’t adding meat, I know a lot of people make soup that way, and I did that when I was trying a juice cleanse. I figured it counted as ” hot juice” LOL! Thanks for reading Tyrone! If I make the chickpea soup (which sounds Amazing) do I need to roast the chickpeas first or can I just blend them raw and never cook them?